The CMCA (motorhome club) rally at Whyalla was a huge success. I think that almost everyone who attended (750 motorhomes) would agree that it was one of the best. I guess we are not really qualified to make that comment given that it was only our third rally - but I can tell you that it was much better organised that the Broken Hill rally that we attended this time last year. We met a number of fellow motorhomers that we hadn't seen for quite a while and made a few new friends. It is interesting to see the club (that has an average membership age of around 67) move to more modern entertainment. Our first rally experience was at Casino (NSW) in 2003. The entertainment was not at all to our liking - music from the 40's! The Whyalla rally had some very good modern music and a fairly raunchy stand-up comedian. Well done CMCA! The rally officially finished on the Sunday evening and most motorhomes were gone from the site by Monday morning. We too pulled out on Monday but moved just around the corner to the local football club grounds and parked with Frits and Riet from the motorhome "The Bleep" - Dave and Shirl from "Tru Blue" were also there. While at the rally we met a couple (Bruce and Julie) who invited us to come and stay at their shack at Lucky Bay - just down the coast a bit. 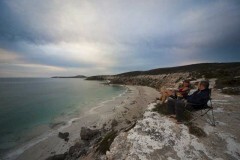 We left Whyalla on Good Friday and parked up on the sand at Lucky Bay. Bruce and Julie arrived back from a few hours fishing with a huge bag of whiting and we all enjoyed fish for dinner. The following day Tracey joined the team on the boat and came back to the bus a few hours later with a few fish to show for the effort. The shallow sandy bottom of this gulf makes this an ideal place for catching whiting and yesterday Tracey and I joined Bruce and Julie at the local whiting spot. I have never seen fishing like this before. We walked out from the beach about 600m to thigh deep water and cast a line. Less than 10 seconds after the bait hit the water, Tracey had a fish on each of the two hooks and I also had a fish hooked. Now this is my idea of fishing! While fish did not continue to bite at that rate, we still managed to come back to the bus with enough fish to freeze and keep us fed for a number of weeks. 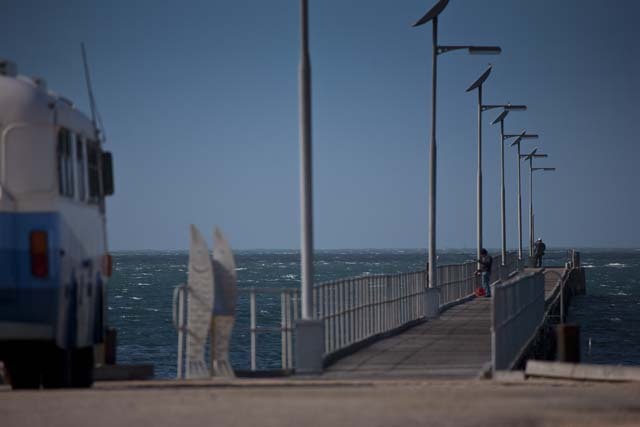 After collecting a half a ton of mail from the post office (one of the issues of having no fixed address), we headed out of Port Lincoln, south towards the tip of the Eyre Peninsular. The last 10km (called Whalers Way) is on private land and so there is a $25 entry fee and a $5 per night camping fee. Last time we were down here we choked on the entry fee and did not venture past the public road. This time we decided to splash out! The road is not bad, but parts of it required the use of the joey box (some steep rocky tracks). After exploring many of the side tracks on the way to the camping area, we were quite surprised to find that we had the place all to ourselves. This is a fantastic bit of coast line, very rugged with clear blue water and huge waves smashing against red cliffs. The knowledge of the breeding grounds of the Great White Shark, just a few km off shore, is the only thing keeping us out of the water. Yesterday we packed a lunch and walked the cliff top walk for about 7km. It is a great place for a walk and we enjoyed eating our lunch watching the huge swells creating great towers of spray as they hit the rocks. It turned out that the $25 entry fee was well worth the price. Unfortunately the entry fee was not the most expensive part of the time in here... as I was standing on a large rock taking a photo, I heard the sound of something hitting the rock. I watched in horror as my 77mm polarizing filter ever so slowly rolled towards a 3 meter drop (having un-screwed from the front of the lens). It of course got to the drop-off 3 microseconds before I did. It then rolled much more quickly the next 20 meters down a smooth rock and into the pounding sea. Bye bye $140 filter! Farm beach used to be well known for the many caravans that perched on the sand dunes during the summer months. This has now been stopped and there are very threatening signs warning of large fines for anyone camping on the beach. This is of course not too much of an issue for Hobohome - we are well aware of the issues that sand and a 12 ton vehicle raise. Not far from the beach (about 3km) there is a wonderful cliff-top area that is ideal for camping, it even has a pathway to a secluded beach. Last time we were down this way, we drove the Moke to this area and had quite some success with the spear gun. At one end of the beach we found a rocky outcrop that was just teaming with fish. The freezer is now packed with fish. After a fantastic few days of fishing in amazingly clear water a significant wind arrived and put an end to the spear fishing. 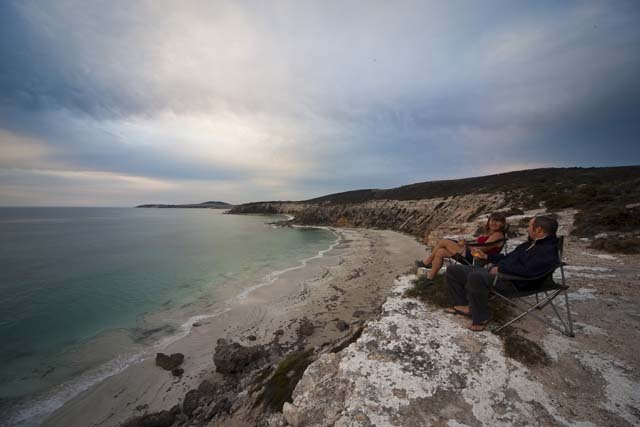 We moved on towards the eastern end of the Nullarbor Plains and camped for the night at a beach near Streaky Bay (Speeds Point). After dark the wind got up - now when I say the wind got up, I mean it REALLY GOT UP. At one point I was really fearful that the wind might rip the solar panels right off the roof. Despite parking with the back of the bus to the wind, the bus rocked and rolled like the King himself - we are now very aware of how clothing feels when put in a washing machine (and not on the delicate cycle)! Neither of us got much sleep that night. The morning revealed no damage to the bus - but the sea was a foaming mass. There will be no spear fishing along this coast for a week or more. 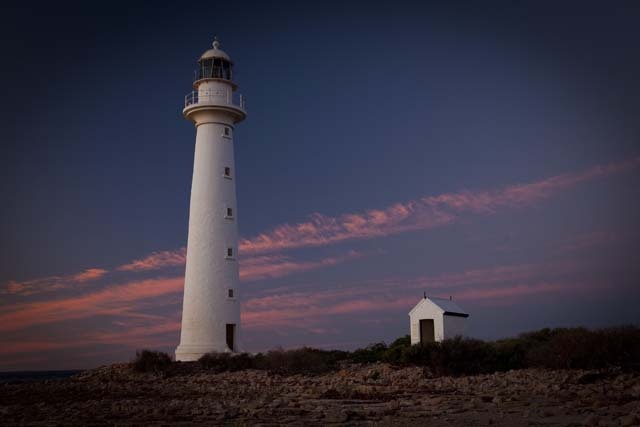 We entered the Nullarbor Plains on Sunday the 25th (ANZAC day) and drove to Fowlers Bay. Now a small word of warning - if you every go to Fowlers Bay in a heavy vehicle, and it has been raining ... don't leave the road to turn around. Yes, we got stuck again. In fact we are still stuck as I write this - we have decided to wait until it stops raining before attempting to free ourselves from the mud (tomorrow).